China has recently tried to change the status quo in the Doklam area of the Bhutan-Tibet border. China is well aware that the area is disputed. It even consented to have a Joint Survey of the area with the Royal Government. And the dispute is not from yesterday. I am posting here the correspondence between Delhi and Beijing on the same issue in 1966-67. Let us hope that the Bhutanese Government will soon issue a White Paper on its boundary with China (Tibet). It will prove that most of the pastures in the Dokham area have for centuries been used by Bhutanese nomads, while the Chinese were nowhere to be seen before the fist years of the 1960s. However the question remains: how can a State which claims to be a responsible power can unilaterally grab a 'disputed' area to built a road on it, especially when it is aware that this road is so strategically located the neighbour, i.e. India. Only Beijing can answer this question. Some say that it is in Chinese DNA, "to first change the status quo on the ground and then later to offer to 'talk'". Incidentally, Beijing always refer to the 1890 Treaty, conveniently forgetting the 1914 Simla Convention and later correspondence and negotiations. The Government of India, in its note issued yesterday, has cited some. In any case, the 1890 Treaty was clearly an 'unequal treaty' as Tibet and Bhutan whose boundaries were 'fixed', were not part of the discussions/agreement. Chinese had been the first to complain of trespassing in the disputed areas. 1. On July 2, at about 1100 hours, two Indian soldiers crossed Latuo La and intruded into Chinese territory for reconnaissance. 2. On July 3, at about 1900 hours, five Indian soldiers crossed the China-Sikkim boundary and intruded into Dongnan grassland in Tibet, China. 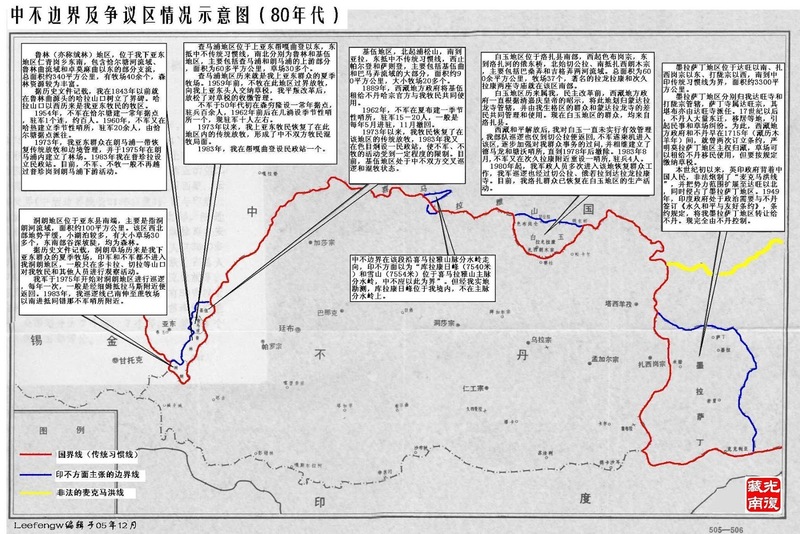 They carried out reconnaissance and harassing raids for as long as four days within Chinese territory before leaving China near Tungcha La around 1300 hours on July 7. 3. On July 10, at about 1800 hours, an Indian soldier crossed the boundary near Tagi La and opened fire at a Chinese shepherd called Trashe Tsewang. 4. On the afternoon of July 22, nine Indian soldiers intruded into Chinese territory from a point north of Cho La. They pitched a tent at the Riwujig pasture and prowled hither and thither for reconnaissance, harassment and the gathering of information and even seized things from Chinese herdsmen. On July 23, two of the Indian soldiers sneaked as far as the vicinity of Hsiasima of Yatung, an important county of Tibet, penetrating into Chinese territory for a depth of about 12 kilometres. It was not until the noon of July 24 after the nine intruding Indian soldiers had illegally stayed on Chinese territory for two days and nights that they left the territory. 5. 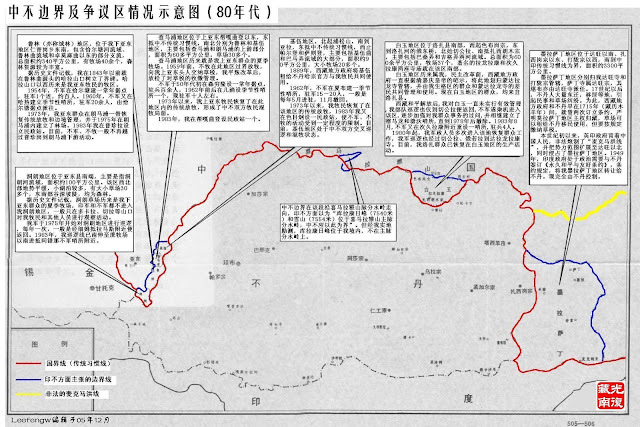 On September 26, at 1630 hours, three Indian soldiers crossed Tungchu La and intruded into Chinese territory for reconnissance and provocation. They were arrested on the spot by Chinese defence troops. 6. On September 30, at about 1530 hours, four Indian soldiers crossed Toka La [Doka-la] and intruded into Tunglang pasture in Dongnan [Dokham plateau] grassland, and with their weapons intimidated Chinese herdsmen who were grazing cattle there. 7. On October 2, at about 1100 hours, 15 Indian soldiers crossed Toka La and intruded into Shu pasture in Dongnan grassland. They conducted reconnaissance and harassing raids for as long as five hours. 8. On October 2, at about 1130 hours, a group of Indian soldiers intruded into Chinese territory through Ya La and opened heavy fire on Chinese frontier guards who were on duty there, firing more than 200 rounds and wounding a Chinese frontier guard. 9. On October 20, at 1250 hours, 25 Indian soldiers occupied Toka La, eighteen of whom openely crossed the Pass and intruded into Dongnan grassland within Chinese territory for provocation against the Chinese frontier guards who were on duty there. The intruding Indian soldiers illegally stayed within Chinese territory until 1740 hours when they withdrew. 10. On November 13, at 0730 hours, more than a hundred Indian soldiers at Tungchu La started a fierce attack with light and heavy machine-guns on Chinese frontier guards who were on duty within Chinese territory. In the meantime, more than ten Indian soldiers crossed the boundary and outflanked and attacked the Chinese frontier guards. Under cross-fire, an Indian soldier, after being wounded, crawled back to the Sikkim side and died there. 11. On December 11, at about 1130 hours, seven Indian soldiers crossed Toka La and intruded into Dongnan grassland for reconnaissance and harassment. After being discovered by the Chinese frontier guards, this group of intruding Indian soldiers fled helter skelter in the same direction from which they had made their intrusion. 12. On December 12, at 1435 hours, more than 30 Indian soldiers intruded into Chinese territory through Tagi La and opened heavy fire with rifles and artillery on the Chinese frontier guards who were on patrol duty there, killing one of them. The Chinese side was compelled to fire back, and three Indian soldiers were captured and five killed under cross-fire. During the latter half of 1965, Indian troops continued to maintain a large number of military works for aggression on the Chinese side of Natu La, Tungchu La, Jelep La and Cho La, and illegally entrenched themselves there. It was not until the Chinese Government set a time- limit in its note of September 16, 1965 for the Indian side to dismantle these military works that the Indian side was compelled to demolish part of them and withdrew helter skelter. 13. During the latter half of 1965, apart from making incessant intrusions by crossing the China-Sikkim boundary, Indian troops repeatedly opened rifle and artillery fire on the border at Chinese frontier guards within Chinese territory. ''In its note to the Chinese Government dated September 30, the Indian Government concocted stories about "intrusions" into Bhutanese territory by Chinese herdsmen and patrols and claiming to be acting on behalf of Bhutan, lodged a so-called protest with the Chinese Government. Following that, with much fanfare Indian Government set its propaganda machine in motion raising a hue and cry about "Chinese intrusions into Bhutan" and the Indian Prime Minister Indira Gandhi came out in person to conduct the campaign against China. 1. The Indian Government's hue and cry about Chinese "intrusions" into Bhutanese territory is an out and out lie, a slander with ulterior motives. 2. The Dongnan grassland (referred to as "Doklam pasture" by the Indian side) where the Indian Government alleged that Chinese "intrusions" had taken place is located in the vicinity of the trijunction of the boundaries of China, Bhutan and Sikkim and has always been under Chinese jurisdiction and Chinese herdsmen have grazed there for generations. According to practice, Bhutanese herdsmen who cross the border to graze on this grassland have to pay for the pasturage to the Chinese side. During the second half of 1965 Indian troops five times crossed the China-Sikkim boundary and intruded into the Dongnan grassland to carry out reconnaissance and harassment against which the Chinese Government protested to the Indian Government on August 27, 1965 and again on January 31, 1966. The Indian Government did not at that time deny the fact that this grassland belongs to China. Now the Indian Government has asserted that the Chinese side had "intruded" into China's own territory, this is really ludicrous and not worth refutation. 3. China has consistently respected Bhutan's sovereignty and territorial integrity. China and Bhutan have all along been on friendly terms with each other without either side committing aggression against the other, and the border between the two countries has always been tranquil. The Bhutanese Government itself has refuted on many occasions the lies concocted by the Indian side about Chinese "threats" to and "intrusions" into Bhutan. It is true that the China-Bhutan boundary has never been formally delimited and if the Bhutanese sides understanding is not quite the same as that of the Chinese side as regards the alignment of the boundary between the two countries at certain specific points, a fair and reasonable solution can very well be found through consultations on an equal footing between the two sides on the basis of mutual understanding and mutual accommodation. China has successfully settled boundary questions left over by history with such neighbouring countries as Burma, Nepal, Pakistan and Afghanistan through friendly consultations. Nevertheless it must be explicitly pointed out that the boundary question between China and Bhutan is a matter that concerns China and Bhutan alone and has nothing to do with the Indian Government which has no right whatsoever to intervene in it. 4. The King of Bhutan has long since solemnly declared that "Bhutan is an independent sovereign state and has the right to conduct her own foreign affairs". However blatantly claiming to be acting on Bhutan's behalf, the Indian Government lodged a so-called protest with China. This is a manifestation of downright big nation chauvinism. Inheriting the mantle of British imperialism the Indian Government has all along been pursuing an expansionist policy and bullying its neighbouring countries. It treats Sikkim as its "protectorate", encroaching upon Sikkim‟s independence and sovereignty. It tries hard to tighten its control over Bhutan and makes every effort to prevent the latter from attaining its due international status and even intends to send troops directly into Bhutanese territory and station them there. The "Indian Express" says undisguisedly in Editorial on October 6, 1966: "There is no formal defence treaty between India and Bhutan to back up the special relationship between the two countries. India cannot go to the assistance of Bhutan to deal with the border situation unless military assistance is specifically asked for by the Royal Bhutan Government. Whether such assistance will be invited is the big question". Following that, the Indian Prime Minister Indira Gandhi openly asserted at the Press Conference on October 7 that India was committed to protect Bhutan. It is thus quite clear that in slanderously charging China with "intrusions" into Bhutan, the Indian Government not only wants to create a new pretext for opposing China and sow discord between China and Bhutan but also is vainly attempting to realize its sinister design of tightening its control over Bhutan under the guise of "protection". But these despicable schemes will not succeed. The Indian Government absolutely cannot cover up its ugly expansionist features by playing the trick of a thief crying "stop thief!" "The Government of Bhutan have, for some time, been concerned with reports received from its patrols of a number of intrusions by Tibetan graziers and Chinese troops in the Doklam pastures which are adjacent to the southern part of the Chumbi Valley. This area is traditionally part of Bhutan and no assertion has been made by the Government of the People's Republic of China disputing the traditional frontier which runs along recognizeable natural features. In the area of the intrusion, the boundary runs along the water-parting along Batang La to Sinchel La. Local attempts were made to inform the graziers and the Chinese troops that they had strayed into Bhutanese territory but these have not been heeded. In view of the succession of violations of the frontier, Bhutan Government urged the Government of India to represent to the Chinese Government so that Chinese nationals and troops refrained from entry into Bhutan in future". In view of the above, Beijing is clearly aware that there is a 'dispute'. China decided on its own to try change the status quo nevertheless. India rightly did not allow it to happen in view of the strategic importance of the area.